We Need The Eggs: "We're Democrats!" These two gentlemen were setup outside of the post office in Southcenter this afternoon. 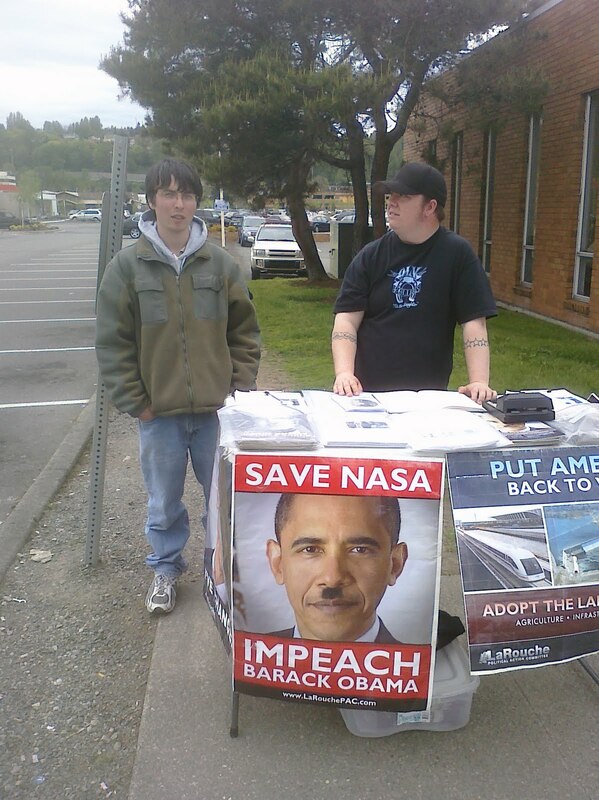 I had seen the "Hitler Obama" picture from far off and I had immediately began to shake. The thing is, whenever I see someone advertising massive stupidity, I feel the need to say something to them. I don't know why I'm this way. There is nothing particularly good or noble about it. Someone who is willing to be that publicly flamboyant and ridiculous is never the person who is looking for an intellectually honest exchange of ideas. But I was particularly upset because one of the things I hate the most in this world is a stupid Republican. The reason being is that if you get a few drinks in me, I'll occasionally admit to being a Republican, but "Obama is a Communist" and "Obama is Hitler" signs and sentiments from Republicans set me back more drinks than my religion will allow. The shaking always sets in because I know I'm going to have to talk to the stupid person, and that's never fun or easy. My game plan was to let them know they brought shame to the Republican name, and then point out that they hated it when liberals called Bush Hitler, so how did it feel to become the thing they hated? So I started by taking the above picture (I asked them if they would like to smile, but they declined), and then I asked: "So are you guys Republicans?" Imagine my surprise and relief when one of them said, "No, we're Democrats!" I know at this point everyone to the left of George W. Bush will say I'm lying, but I swear it's true. "Thank God," I said. They chuckled, not yet understanding what they were in for. Then I explained how I was going to tell them they were bringing shame to Republicans, but that that was now out the window. After that I asked, "Do you really believe Obama wants to kill 6 million Americans?" "Yeah, he already signed the healthcare bill that will kill 100,000 Americans." "No, it won't," I said. And that's when I saw it. I was looking at their table of pamphlets and saw his name, and that's when my main emotion changed from anger to pity. The name? Lyndon LaRouche. He's a perennial runner for president. I'm not going to get into it, but I think it's safe to say that most people who have any experience with a Larouche-ite put them on the same shelf of crazy as alien abductees and flat-earthers. Anyway, more on that later. I tried to explain that they can have no credibility when they are espousing such a ridiculous belief. "Wait, you're a Republican and you like Obama?" asked one of them. "No, but I don't think he's Hitler." Then I tried to reiterate one last time that they didn't really believe that. One of them literally said, "We don't have to defend ourselves against you." And the other said, "Yeah, your academic BS..." And that was it, an unfinished musing on the nature of argument. What could I respond with? Moral of the story: Democrats are dangerous. Clearly these boys are the offspring of Democratic ideology. They don't even go with the more socially acceptable "Progressive," it's all Democrats for them. This is the ultimate logical conclusion of believing in Democratic (note the big D) values: standing outside a post office with Obama is Hitler signs. No, now that's ridiculous. But no more ridiculous than saying that a crazy Tea Partier represents what Republican's stand for. Being a nutbar knows no ideology. I used to believe that liberals/progressives/Democrats were more susceptible to being nuttish, but that was a belief I had to jettison shortly after Obama took office. No, the net result is that it's just sad. Someone got ahold of their young brains and polluted them...you can't hold the boys responsible, but they're anything but innocent. They're like telemarketers on their first or second day: They still actually believe in their product and think it's a worthwhile investment that everyone should have. Same thing happened to me, only it was worse: In 2000 I was so twisted, mixed up and confused that I cast my vote for—Ralph Nader. Going There: Can I Convert You?